Few will recognize the name of Sister Maria Innocentia, which is the name she took when she became a nun. But at the mention of her last name many will associate ceramic figurines with her for her last name was Hummel. 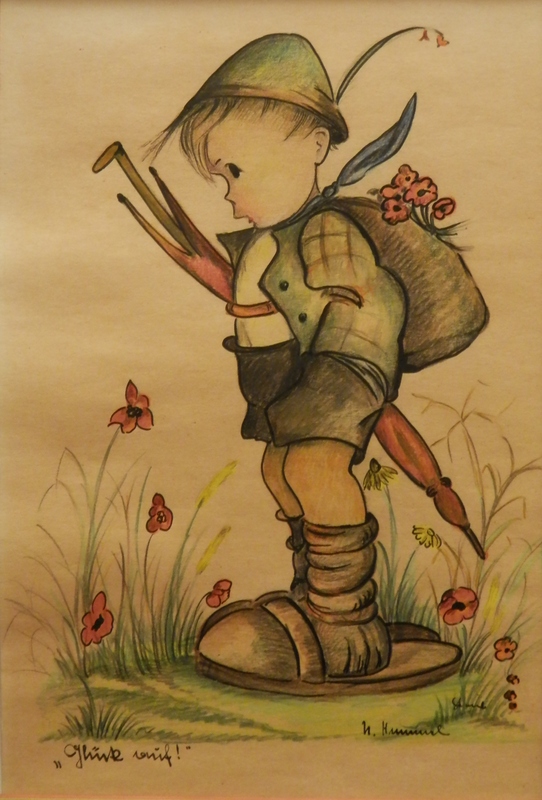 #BertaHummel was born in 1909. Her artistic talent was spotted early by her father and she went on to study art in Munich. She came from a devout Catholic family and after her studies she applied to join the Congregation of the Franciscan Sisters of Siessen. She was accepted as a postulate and as a novice taking the name #SisterMariaInnocentia. The convent used her talents by sending her to local schools to teach art. She loved to draw pictures of children and the convent was so impressed they sent them to a publisher. He loved them and published them in postcard form and later a number of her drawings in Das Hummel-Buch. The postcards and book were seen by porcelain artwork factory owner named #FranzGoebel who was looking for a new line to produce. An agreement was reached and Goebel was given sole right to create the figurines on her artwork. The figurines became popular and although the war years slowed sales they were buoyed by American servicemen buying and taking them home when on leave. Her painting titled ‘The Volunteers’ was denounced by Hitler and the distribution of her art was forbidden in Germany. Hummel also drew sketches that contained the Star of David, a dangerous theme in those times. She drew angels in gowns covered with slightly skewed six-pointed stars. She designed items for the convent. Her ‘Stations of the Cross’ truly express her artistic individuality. She symbolized the juncture of the Old and New Testaments by designing a cross with a menorah before it. Sister Maria was diagnosed with tuberculosis in 1944 she survived to see the French liberate the convent but died on 6 November 1946 at the youthful age of 37. Goebel ceased producing the figurines in 2008 even though they remain popular. A life too short, a talent gone but her legacy remains and will, I hope, continue for a long time into the future. 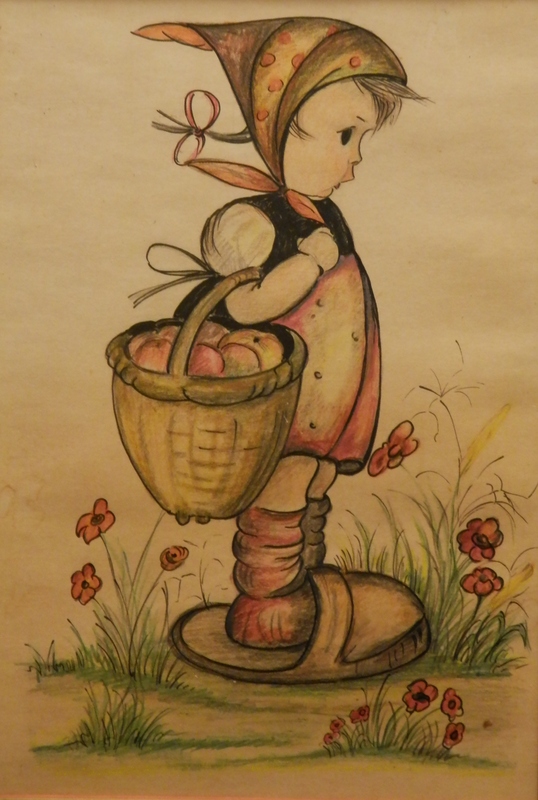 This entry was posted in Drawings and Sketches and tagged apples, basket, boy, cap, clogs, flowers, girl, Goebel, Hummel, scarf, umbrella. Bookmark the permalink. I have this picture of the little girl. It is in frame, but I cannot see a copyright stamp on it . Is it possible it could be a actual drawing. I think it is beautiful either way and was quiet intrigued with the Sisters story. Without seeing your image first hand, I am unable to tell you whether or not it is an original drawing or print. If there is an auction house near you, their specialists could look at it and tell you. She was a talented artist and her story is remarkable, I agree.